Two schoolgirls from Hertfordshire are looking forward to a summer to remember when they compete at Glasgow 2014. Amarah Phillip, 15, and her 13-year-old sister Elinah will make history when they become the first swimmers to represent the British Virgin Islands at a Commonwealth Games. The girls, who both attend the Onslow St Audrey's school in Hatfield, will have the opportunity to try out the Tollcross International Swimming Centre - the swimming venue for the Games - when they compete at the Scottish Gas National Swimming Championships this weekend. "I think it is very exciting but very nerve wracking because I will be competing against some of the best (at Glasgow 2014)," commented Amarah. "I hope to achieve a personal best and gain experience. "I hope the Commonwealth Games is an amazing experience for both me and my sister. It is the biggest competition that we have ever been to. I think we will learn from the Games." Elinah will be one of the youngest competitors in Glasgow. She thinks this prospect makes her nervous, but - like her older sibling - she is determined to perform. She said: "I will go out and give my best. I feel proud (to represent the British Virgin Islands) and I hope I will do good enough. "I think it will be a really good experience and an amazing opportunity. It will help us improve a lot." The British Virgin Islands is a British Overseas Territory in the Caribbean with a population of around 23,000 people. Its preparations for the Commonwealth Games in Glasgow were in the spotlight this week as the Queen's Baton Relay, the main event in advance of the Games, was in the British Virgin Islands. While swimming is a popular pastime on the islands, there are no facilities to support competitive participation, such as a 50m pool. With the success of the sisters so far and a growing interest in the sport, a spokesman from the British Virgin Islands Olympic Committee said there are plans to build a pool in the near future. Both Amarah and Elinah intend to compete at four events at the Games - 50m freestyle, 50m butterfly, 100m freestyle and 100m butterfly. The Islands plan to send another seven athletes to Glasgow in athletics and squash. The Phillips sisters have already tasted success in the pool, with the pair winning 16 medals between them at last year's OECS Swimming Championships for Caribbean nations. Their father is Elsworth Phillip, the President of the BVI Swim Federation in their home country. The story of how the girls ended up studying at a school in the Home Counties centres on their mother, Tracy Bradshaw. Tracy, Amarah and Elinah first moved to the United Kingdom in 2005 when Tracy studied law at the University of Bristol. In 2009, the trio moved back to their Caribbean home before returning to the UK in 2012 to settle in Hatfield. While in the UK, the girls started to take swimming seriously. Tracy said: "It is very good to represent the British Virgin Islands. I am very proud and very excited that they have been given this opportunity. "The competition in Glasgow this weekend will be good for them - seeing the facilities, competing in the same facilities. As I understand it, the meet will be set up in the same way as it will be set up for the Games. It will be a good experience for them and take some of the edge off." On the prospect of her girls becoming the Islands' first Commonwealth swimmers, she added: "I think it an incredibly proud moment for me as a mother, but for us as a country I think it is an important step in the development of the sport at home. "Even now, there is a lot more interest in the sport at home because of their accomplishments." Back in Hatfield, the girls are being supported by their classmates and teachers as they get ready for Glasgow. Michelle Crosby is the head of physical education at Onslow St Audrey's. "It is an absolutely amazing achievement," she said. "It took us a while to find out what the girls did as they are two very modest young ladies. They are so dedicated and committed and they are two lovely students. "As it comes up to the Commonwealth Games, we will be using the girls as an example because they train so hard. We will have a full school assembly and get a bit of support behind them, and let everybody know so they will be watching them in the summer." On Saturday, both Amarah and Elinah will compete in the 50m butterfly competition. 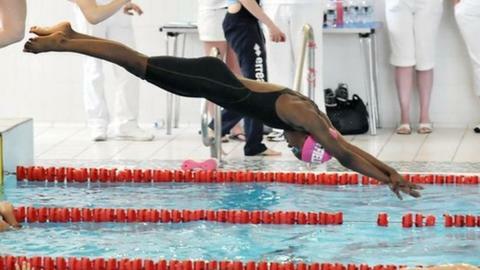 The following day, Elinah will race in the 100m freestyle. For spectators in Glasgow, they will get a glimpse of two teenagers who are ready to make history in the same pool in a few months' time.